As vaguely promised, we lead you into this bank holiday weekend with something to scare the rain clouds away, not one but two releases from BBC Worldwide. Both turning up on 24th June! 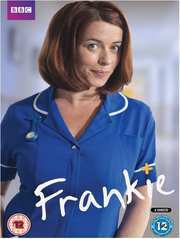 The first is medical drama Frankie, which stars Eve Myles of Torchwood and Skins fame. This is currently screening on BBC One, will be spread across two discs and carry a recommended retail price of £20.42. A heroine for the modern age, district nurse Frankie Maddox looks life and death in the eye on a daily basis; her mission is to make a difference. She cares about her patients and their families but never turns into a busybody, knowing that, at the end, what everyone wants is a calm friend who is on the side of the patient. Heart-warming and funny, the series follows Frankie and her eclectic team as they visit their patients at home, and takes a look at ordinary lives which are often in huge domestic crises. The nurses enjoy their work, it may infuriate, frustrate and even bore them at times, but they turn up day in and day out and wouldn’t choose to do anything else – even when missed birthday parties and emotionally neglected kids are the order of the day. All that matters, whatever their flaws, is that they do a good day’s work, and make life better for their patients. Joining the above is none other than a Doctor Who: Regeneration Box Set, which will set you back around 50.03 of your Earth pounds. This six disc set contains not only every regeneration of our favourite Time Lord, but the full stories as well. After all, they wouldn't make much sense if you just saw the final cliffhanger episode would it? Presented as a limited edition coffee table book, it contains nearly 1000 minutes of Doctor Who content spanning from its birth to the most recent regeneration into the Eleventh doctor, fans will be able to read through the story of the Doctor’s transformations accompanied by never seen before images from the archives.